Houston ISD students from Hartsfield Elementary School will be given an exclusive opportunity to speak with and interview NASA astronaut Dr. Peggy Whitson, who is currently living and working aboard the International Space Station, where she serves as the flight engineer on Expedition 50. Students in the third, fourth, and fifth grades will ask Dr. Whitson about her time in space and what motivated her to become an astronaut. The 20-minute Earth-to-space call at 9 a.m. on Friday, March 3, will allow students to hear and see crewmembers live from space. The livestream of the call will air on NASA Television and http://www.nasa.gov/nasatv. This entry was posted in News and tagged Hartsfield Elementary School, NASA on March 1, 2017 by HISD Communications. 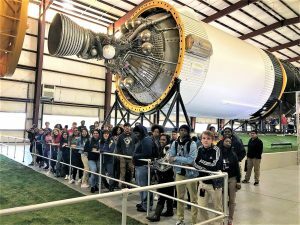 Multiple Houston ISD schools are partnering with NASA to allow students the opportunity to produce equipment and apparatus for the space agency. The HUNCH program, or High School Students United with NASA to Create Hardware, is in its tenth year and has expanded to 13 states. In the program, based out of the Johnson Space Center, students to use their skills in science, engineering, technology, and mathematics to build various devices. This entry was posted in High Schools, News and tagged Barbara Jordan High School, Booker T. Washington High School, Madison High School, NASA, Sterling High School on April 25, 2013 by HISD Communications. The Space X Dragon which is now headed to rendezvous with the International Space Station is carrying two experiments made by four Houston Independent School District students as well as two student-designed mission patches. The Dragon launched Tuesday morning at 2:44 a.m. CST from Cape Canaveral, FL. The National Center for Earth and Space Science (NCESSE) and NanoRacks, LLC, have developed the Student Spaceflight Experiments Program (SSEP), aimed at helping today’s students become the scientists and engineers of tomorrow. The program gives the students the opportunity to be involved in a national space project with a focus on STEM education via the Nano-Racks payload. Johnston Middle and Parker Elementary were two of the schools selected from 12 communities in the United States. Hundreds of students in grades 5- 8 were given the opportunity to design and submit experiments to be performed in microgravity aboard the space station. From 267 formal experiment proposals received, two were chosen to go to space. Emily Soice from Johnston Middle School and Michael Prince, Maxx Denning and Aaron Stuart from Parker Elementary school had the winning proposals. Both schools also held an art contest for the mission patch design. Fifth grade Parker Elementary student Christian Astorga and eighth grade Johnston Middle School student Sebastian Beil designed the winning mission patches. The students conferred with STEM experts from Rice University, the National Space Biomedical Research Institute (NSBRI), NASA, Pfizer, Texas A and M University, the University of Houston, Baylor College of Medicine, and Texas Southern University. The students also had the opportunity to visit research facilities to prepare for their experiments for flight. The Student Space Flight Experiments Program (http://ssep.ncesse.org) is undertaken by the National Center for Earth and Space Science Education (NCESSE; http://ncesse.org) in partnership with Nanoracks, LLC and is enabled through NanoRacks working in partnership with NASA under a Space Act Agreement as part of the utilization of the International Space Station as a National Laboratory. During the Dragon’s 21-day mission it will dock with the space station where it will deliver about a half ton of supplies along with cargo from NanoRacks containing 15 student-designed SSEP experiments from around the United States. Dragon will be the first privately-owned spaceship to dock at the space station. This entry was posted in Elementary Schools, Middle Schools, Science and tagged International Space Station, Johnston Middle School, NASA, NCESSE, Parker Elementary School, Space X Dragon, SSEP, STEM on May 23, 2012 by HISD Communications. Two HISD student science projects are cleared for lift off. Johnston Middle School and Parker Elementary School students will have their microgravity experiments included in Mission One to the International Space Station through the Student Spaceflight Experiments Program. More than 1,000 students submitted proposals and 12 U.S. school communities were given the chance to compete. Johnston and Parker students recently learned that they were among a handful of winning schools whose projects will fly aboard a Soyuz rocket in the spring of 2013. Johnston eighth-grader Emily H. Soice led her school’s winning project. 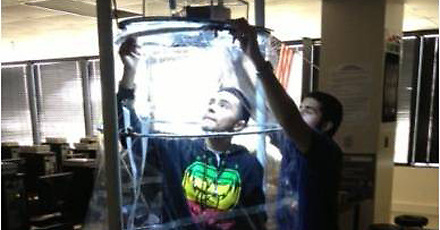 Soice’s experiment explores whether a bioscaffold infused with the TGFB3 protein grows and forms cells faster in microgravity than in normal gravity. Bioscaffold is an artificial structure that can be implanted in the body to serve as a base where tissue can grow. Soice’s research could lay the groundwork for the growth of replacement tissue, joints, and even organs. At Parker Elementary School, fifth-grade students Maxx Denning, Michael Prince, and Aaron Stuart will test to see if liquid Vitamin C can preserve bone density in microgravity, which could be helpful to astronauts who stay in space over a long period of time. Mitchell said the students worked after school, during their lunch break, and even on weekends to create their winning proposal. The students will conduct their Vitamin C experiment using a chicken bone. Researchers, biologists, physicists and many others from institutions including Baylor College of Medicine, NASA, Rice University, University of Houston and Texas Southern University provided support for the project. For more information, please visit www.ssep.ncesse.org. This entry was posted in Middle Schools, Science and tagged HISD, International Space Station, Johnston Middle School, NASA, Parker Elementary School, Rice University, Texas Southern University, University of Houston on January 12, 2012 by HISD Communications.